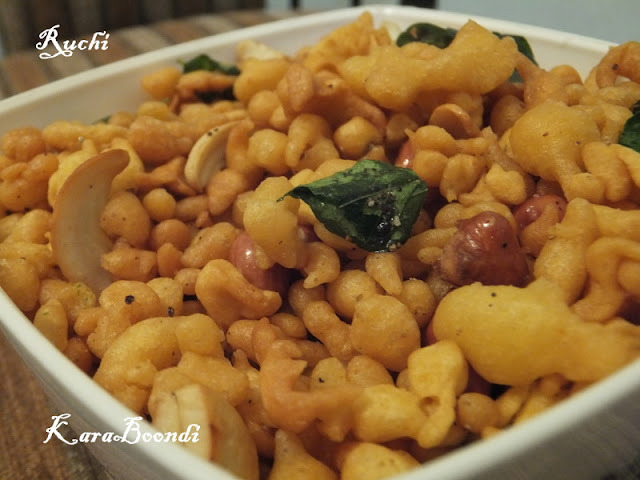 Kara Boondi is a simple savory .I prepared for Diwali.. It is a crunchy snack. The method for making ladoo and boondi is the same. 2. Add little water and mix it well without lumps. Then add more water little by little and make a slightly thin batter. The batter should neither be very thin nor thick. 3. Heat oil in a kadai for deep frying. When the oil becomes hot, to check take the boondi ladle and pour a little batter on the ladle. The batter will fall through the holes into the hot oil. f it drops as perfect rounds then the batter is perfect. 4. Fry the balls till golden brown till the oil sound subsides to get crispy boondis. 5. Take it out from oil and drain in tissue. Repeat this for rest of the batter. 6. When it is done transfer everything to a wide bowl. Feel like munching some,tempting crispy beauties Akka.